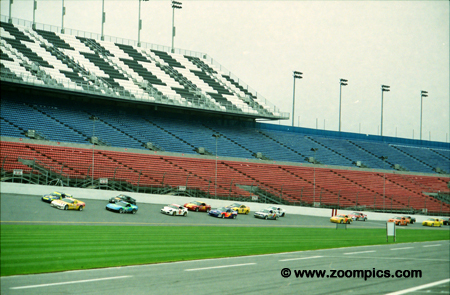 The 2001 Motorola Cup series opener was held at Daytona International Speedway. The two-hour race would be the last with Motorola as the title sponsor. 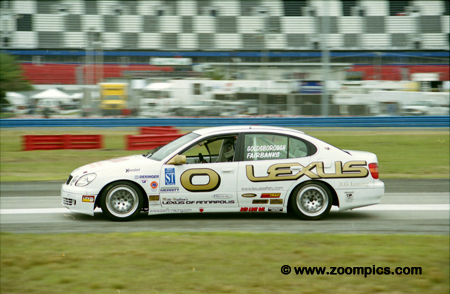 The Berman Motorsport Group had managed the series for the previous six-years but when Motorola did not renew their contract Grand-Am took control. 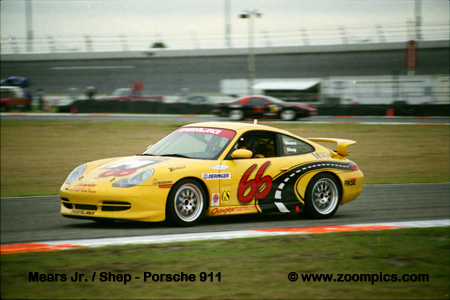 Until a new sponsor was found the series it would be called the Grand-Am Cup. The two-hour race for street stock cars took place Friday afternoon and was a support event for the Rolex 24-Hour. Seventy-seven qualifiers (12 – SGS, 35 – GS, 17 - ST and 13 – C2K) take the green flag. The two-hour race would be the last with Motorola as the title sponsor. The remaining nine rounds would be called the Grand-Am Cup. 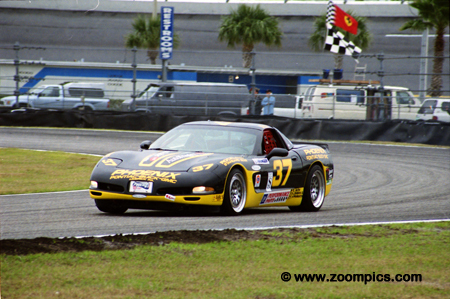 Doug Goad and Devan Powell kicked off the Grand-Am Cup season by taking the checkered flag at Daytona International Speedway in the Powell Motorsport Chevrolet Corvette. They started from the pole and although the team suffered various mechanical problems (high oil temperatures and low oil pressure), they never fell out of the top three during the two-hour event. 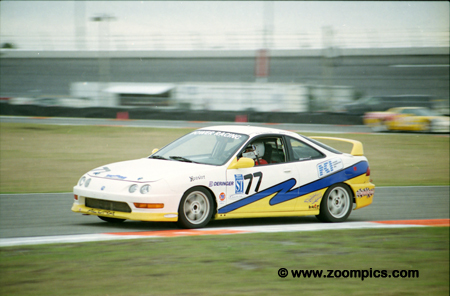 The Power Team Racing Acura Integra Type R completed 49-laps and won the Sports Touring class. 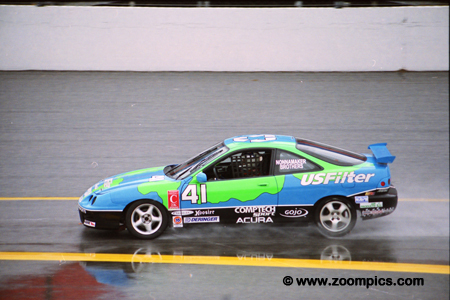 The car was driven by Jason Potter and Mike Keravich III started from the forty-third position on the grid and was the quickest Sport Touring team. The No. 71 Grand Sport class BMW M3 of Steve Pfeifer and Mike Helton returns to the track after spinning at the West Horseshoe. The team only completed 11-laps and were the second team to retire from the event. Sharing the No. 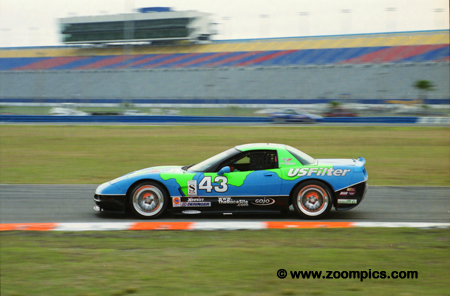 43 Planet Earth Motorsport Chevrolet Corvette were endurance racing veterans Joe Nonnamaker and Bill Pate. The pair started eighth and after 51-laps of racing finished second overall and in the SGS class. They contributed to an all Corvette podium. 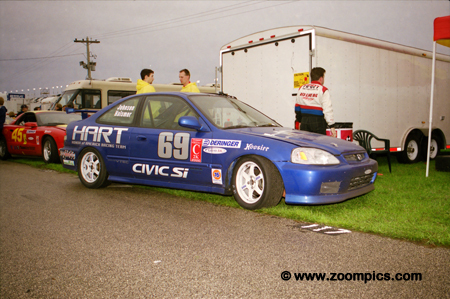 Peter Halsmer and Bryan Johnson drove the class winning Honda Civic Si which started second in C2K. The car was prepared by the Honda America Racing Team (HART) which was a group of employees from the Honda’s manufacturing facility in Marysville, Ohio. The No. 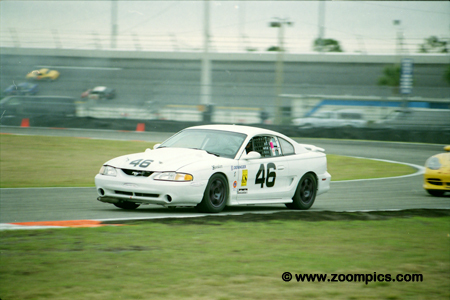 46 Ford Mustang Cobra R driven by Chuck Snipes and Peter Sachs started sixteenth overall and fourth in the Grand Sport class. The duo was able to improve upon their starting position and finish second in class and ninth overall. 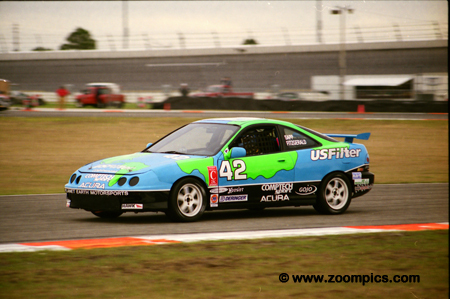 The second Planet Earth Motorsports Acura Integra GSR was shared by Mike Fitzgerald and Neal Sapp. 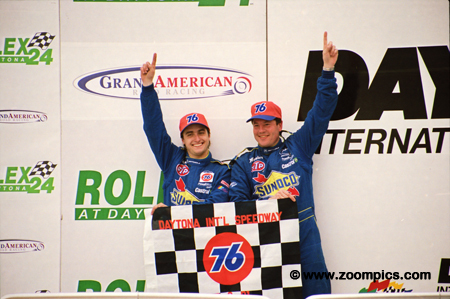 These two drivers were TC Kline Racing teammates during the 2000 World Challenge season. They both scored victories in the series and Sapp won the World Challenge Touring Car Rookie title. 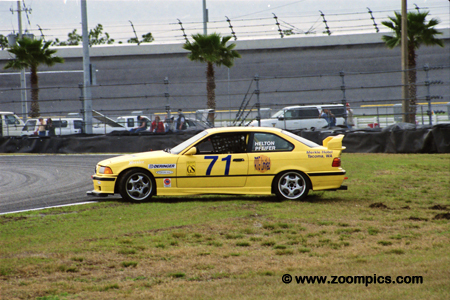 At the Daytona opener in 2001 they finished second in the C2K class. Finishing 14-seconds behind the Sports Touring class winning Power Team Acura was the No. 0 Lexus GS400. This car was driven by Terry Borcheller and Chuck Goldsborough. At the third race of the year, in Phoenix, the team would debut the new Lexus IS300. Although the IS300 did not win in its first year it started to show promise by mid-season as the team regularly achieving podium finishes. GM Engineer John Heinricy was the fastest qualifier in the No. 37 Chevrolet Corvette. According to the rules, the driver qualifying the car starts the race. A decision was made by the team to have co-driver Bill Lester start the event which meant the car would take the green flag from the back of the grid. Despite starting last and an accident late in the race Lester and Heinricy finished third overall and in the SGS class. Starting from the twenty-fifth position and twelfth in the Grand Sport class was Robert Julien and Steven Goodbody. 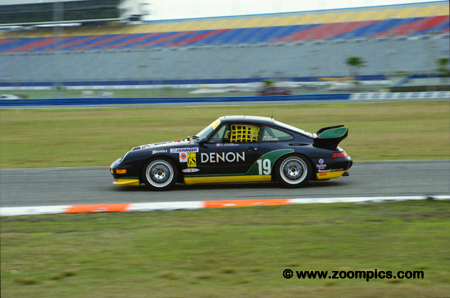 At the checkered flag, they had moved their Porsche 993 up to a tenth place finish which resulted in a third in class. The Nonnamaker brothers finished third in the C2K class behind their teammates (Mike Fitzgerald and Neal Sapp) and the Honda America Racing Team (HART). It was about to be a long season as the rivalry between the Nonnamaker's Planet Earth Motorsport team and HART would last the entire year.